"Every other day, Kali D'Angelo is a normal sixteen-year-old girl. She goes to public high school. She attends pep rallies. She's human. I was mega excited when I received this book to review. I've had Jennifer's previous books on my shelf for a while, but as often happens I just hadn't gotten to reading them yet. In some ways I think this could be a positive thing as I wasn't reading it expecting other characters to pop up or another storyline to be there. The cover is awesome. 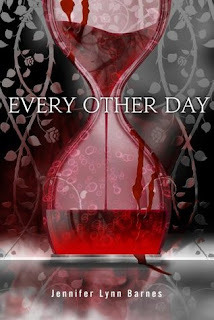 I love the idea of the blood filled hour glass - such a subtle yet sinister cover image. I'd never thought of an idea like this before and so it was a very new reading perspective for me. When you think of it, it would be so hard to adjust to having super human powers one day and the next being just a mere mortal. You could imagine yourself getting into sticky situations when its definitely not the right day to do so. 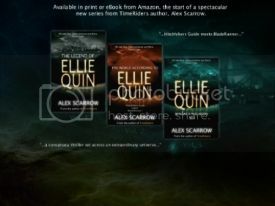 I actually found the story somewhat reminiscent of Buffy the Vampire Slayer - a very normal looking girl, that can do extraordinary things. I did find the urges of Kali more like Faith though - the renegade Slayer who lived for the kill. The descriptions are particularly vivid and brutal, which had me going Ewwww a few times. Secretly though I do like a gross out session now and again. Jennifer has a great way of tidying up the back story in a quick way, but done early on. I often find it frustrating when you keep going back over old ground or when you are out of the loop on something. Big thumbs up to Jennifer!! The world of Kali is quite like ours today, but with supernatural creatures thrown into the mix. Obviously that is a fantasy element, but this didn't feel like a fantasy story to me at all and I think that fact made it even more enjoyable to me. It was a place that was somewhat relate able too and not totally foreign. The book takes quite a unique turn for a YA book in my opinion and I really enjoyed this. I didn't see it coming and a surprise is always fantastic!!! The only thing is, I was left wondering if there is more to come and I still don't know.....Is there???? I've been meaning to read this one. I had it on NG but it got archived before I could read it. It sounds really unique and that's the main reason I want to try it. Lovely review!! OMG - wow, this sounds amazing. I haven't heard of it before but it's so going on my wish list now.